Sushma Swaraj gives a swift reply to a Twitterati for comparing her sense of humour with that of Rahul Gandhi. New Delhi: Sushma Swaraj on Wednesday delivered a swift reply to a man who compared her sense of humour with that of Congress President Rahul Gandhi. The response garnered around 1,000 retweets and over 6,000 likes. The Bharatiya Janata Party (BJP) minsiter is known for her quick and prompt responses on Twitter. Earlier, a netizen blurted out harsh words for Sushma Swaraj on Twitter, however, the External Affairs Minister was all help to that person. 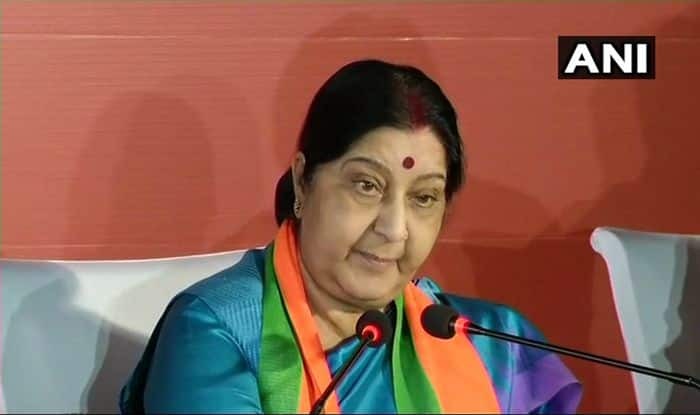 The man chided Swaraj on Monday saying that she was “not a chowkidar” and how he lost a career opportunity because he did not get his passport on time. To which Swaraj replied, “Thanks for your compliments. My office will get in touch with you today and help you get the passport.” Swaraj also tagged a tweet by her additional private secretary in which that person was told that he applied for a normal passport on March 13 without proper address proof and he submitted the address proof on March 20.